Newsflash! After seven years of jillicious, I've decided that it's time to move onto something new, so as of June 2016 I won't be making preserves to sell. I'll still be making preserves to have at home though - I definitely have the preserving bug so I'm not sure I could go through a year without making marmalade, or jam, or chutney, especially when we have so much amazing fruit and veg growing in our garden! Welcome to the jillicious! website! jillicious preserves specialises in making tasty, homemade preserves with seasonal, local fruit and veg, whilst jillicious time for tea brings a tea party to you for that special occasion....and if you're after a teacosy to keep your teapot warm, look no further than jillicious tea cosies! Since I love making jams, chutneys and relishes (and they seem to go down very well when I do!) 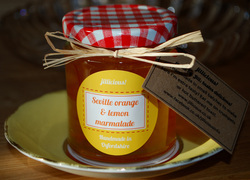 I decided to start up my own venture making and selling preserves and 'jillicious!' was born! I love nothing more than taking the time to sit down for a cup of tea and a piece of cake; what a treat! With this in mind, jillicious time for tea brings a tea party to you for that special occasion. Choose from finger sandwiches, scones with clotted cream and jillicious jam, and home made cake - all washed down with a cup of tea served in a vintage china cup and saucer! These gorgeous jillicious tea cosies are hand knitted using recycled wool and buttons where possible, and are just what you need to keep your pot of tea nice and warm!